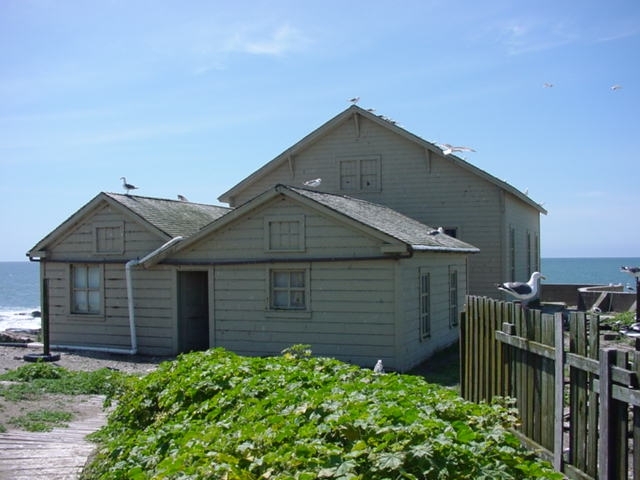 Operating between 1872 and 1948, the Año Nuevo Island Light Station formed an important part of the aids to navigation along California’s coast south of San Francisco. Installed as a result of several catastrophic shipwrecks along the nearby coastline, the station initially contained a fog signal. Later, a light was added, along with an elaborate keeper’s dwelling, tramway, dock, boathouse, and various other support facilities. 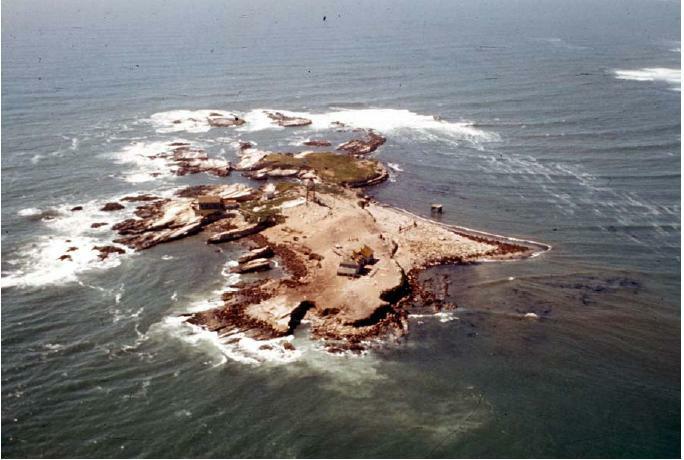 Named by Father Antonio de la Ascension, chaplain for the Don Sebastian Vizcaino expedition, Punta del Año Nuevo appears much as it did that day on January 3, 1603. Following this Spanish expedition little changed along this part of the California coast until the increase in commerce and shipping during the American period. Point Año Nuevo, Pigeon Point, and Franklin Point, all presented hazards to ships passing along the coast. They each contain a low profile of rocks projecting into the sea. Point Año Nuevo was described aptly by Col. Albert Evans: “It is a place where black reefs of rock rear their ugly gangs, like wild beasts waiting for their prey” (as quoted in Le Boeuf 1981:37). With the thriving shipping activity, numerous wrecks occurred along this treacherous stretch of coastline. One of the earliest recorded was the Carrier Pigeon on June 6, 1853, and leading to the change in the name of the point from Whale to Pigeon Point. This merchant clipper ship, departing from Boston in January 1853, sailed around Cape Horn to the California coast. As thick fog obscured the shoreline, the ship ran aground and eventually broke apart. Although no lives were lost, the entire cargo was. Though the U.S. Coast Survey recommended building a lighthouse at the point as early as 1851, a lighthouse at Santa Cruz was authorized and constructed first. On January 17, 1865, another clipper, the Sir John Franklin on its way to San Francisco from Rio de Janeiro broke apart on the rocks between Pigeon and Año Nuevo points. The dense fog made visibility virtually zero, and the ship became lost. One of the most infamous wrecks was the Coya, on November 24, 1866, which while in deep fog hit a reef and sank quickly. Only three people out of the 30 on board survived. It was perhaps this wreck more than any other that prompted the call for a lighthouse in the vicinity of Point Año Nuevo. Soon thereafter, the island was reserved by the President for lighthouse purposes. Loren Coburn, however, claimed ownership of the island and demanded a large sum for it. After much delay and wrangling, in 1870, the federal government purchased the island, along with Pigeon Point from Coburn. In 1872 a steam fog whistle, together with a keeper’s dwelling was built on the island. 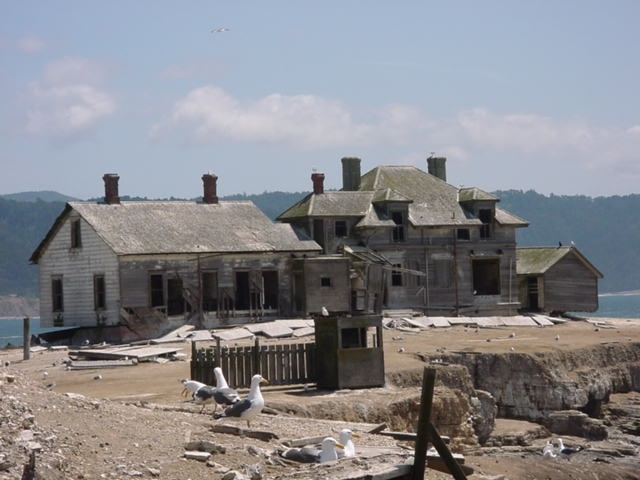 The facilities were apparently constructed under the supervision of Phineas Marston, who had also overseen construction of the Pigeon Point Lighthouse (Perry 1999), and several others. 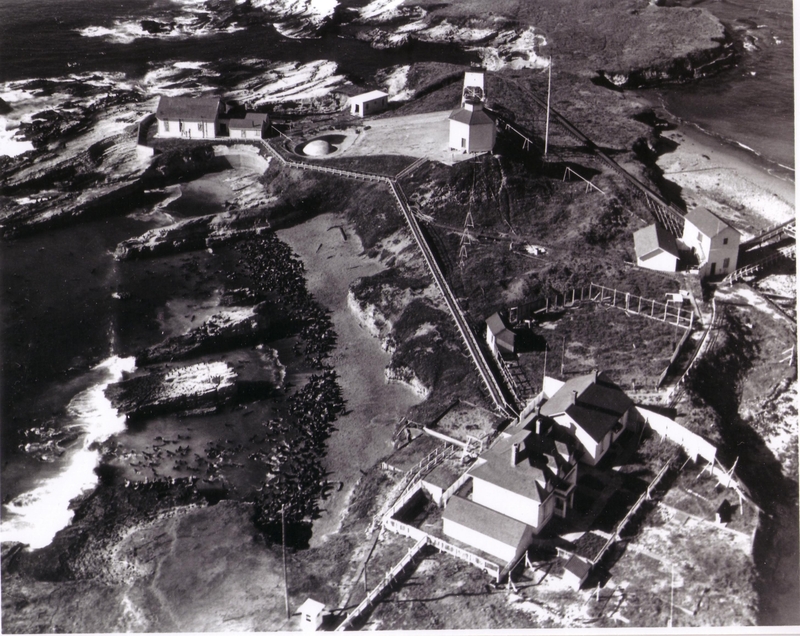 The station became operational on May 29 (U.S. Lighthouse Board 1872). 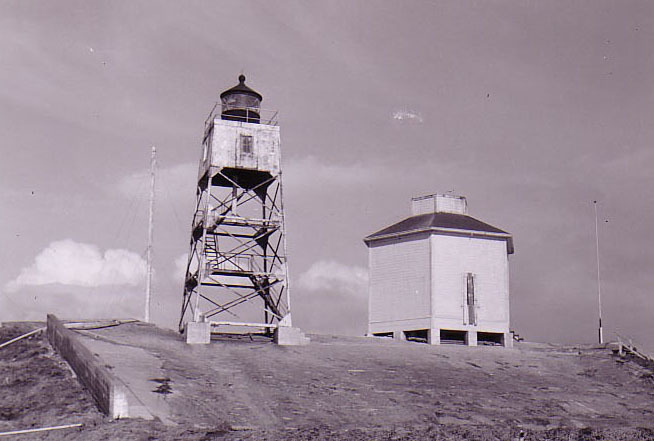 In 1890, a light was constructed on the island order to add to the warning system. The light consisted of an oil lens lantern and was mounted on top of a water tank. In 1914, a larger lens was installed on a steel tower, 73 feet above the water. In 1906, an elaborate keeper’s dwelling was constructed adjacent to the original, and included 8 rooms for the head keeper and 7 rooms for the assistant keeper. 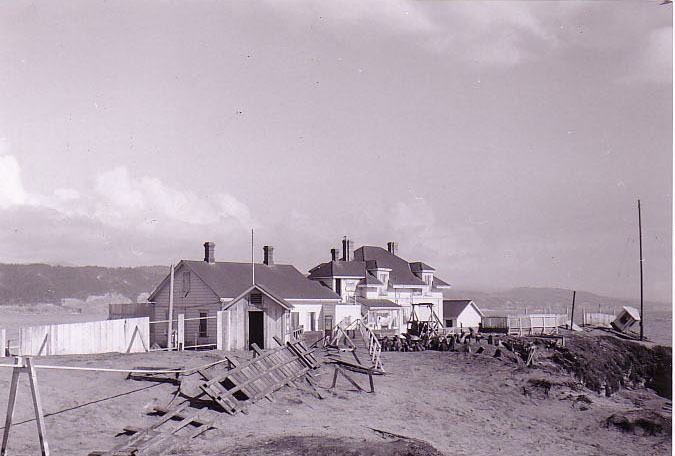 Maintenance of the buildings on the island was a constant problem as a result of the sea air. 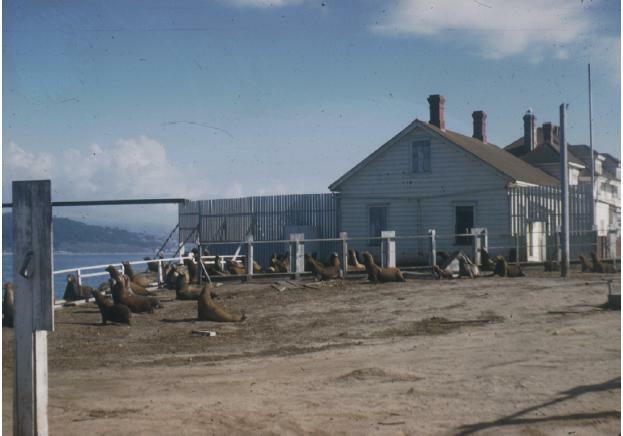 Although fences were built to prevent the sea lions from coming into the gardens and the houses, the fast-growing herds of seals however, often over-ran the house. Other improvements to the island consisted of a water catchment basin, together with a cistern and a tank, a tramway, several wood catwalks, a boathouse, carpenter’s shop, chicken house, and several small storage buildings. Following several decades of faithful service, the station was ordered closed in 1948. The Coast Guard determined that the expense of maintaining the island was too great, and a marker buoy with automatic light, sound, and radar reflector replaced the fog signal and light. In 1955, the federal government sold the island to the state of California. The state classified the island as a scientific preserve, eventually restricting public access and use in order to protect the seal breeding colonies. Despite their being hunted almost to extinction by the turn-of-the-century, the northern elephant seal had made a remarkable comeback. A seal was first reported on Año Nuevo Island in 1955, and the first birth was recorded in 1961. Thereafter, the buildings on the island were largely left to deteriorate. Visitors lit fires, vandalized the remains, and generally wreaked havoc. Many of the remaining structures were burned (including the boat house, tramway, and various sheds). The unforgiving climate also quickly took a toll. Wildlife researchers moved into the fuel storage building as well as the fog signal buildings, leaving the others to deteriorate. 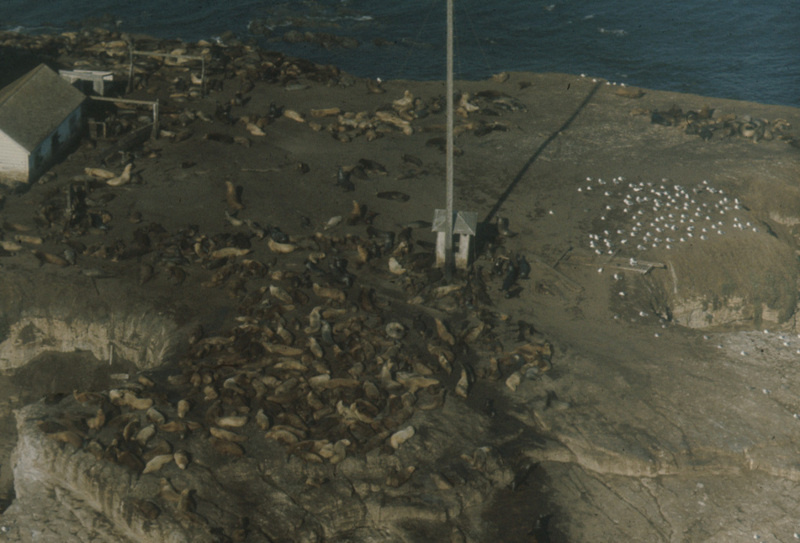 The elaborate keeper’s quarters was soon completely taken over by elephant seals, sea lions, and various bird species. Rapid decay was the result. The light tower was cut down by the state in 1976, for safety reasons. Today, the island serves as a wildlife reserve, and is closed to the public.